In ICC’s retrospective Test Championship Player Ratings, May finds a respectable fifth spot on the batsmen’s rankings. Peter Barker Howard May, CBE, was a former England cricketer who played 66 Tests for his country between 1951 and 1961. A stylish personality both on and off the field, May was a middle-order batsman in the classical mould. A natural leader, May captained England in 41 Tests — most number of matches for a long time — and won 20 of those. After taking early retirement from the game, he did make a comeback to cricket as an England Test selector and President of MCC. On his 86th birth anniversary, Chinmay Jawalekar looks at 22 facts from the life of the cricketer, who left behind a rich legacy as England and Surrey captain. 1. Early Life: May was born in Reading, Berkshire, in a family which had no cricketing background. He developed interest in the game at a very early age and would spend many hours hitting the ball in the garden and on the hard tennis court at the back of his parents’ Reading house. 2. Education: May was educated at Charterhouse and Pembroke College, Cambridge. At both the institutions, he was regarded as a batting prodigy. 3. Mentors: In his formative years, May was mentored by the former Berkshire and Sussex cricketer, Robert Relf, a master at the Reading preparatory school which he attended, and George Geary, cricket coach at Charterhouse. Geary, in particular, guided him in his approach to batting, emphasising the importance of concentration and the necessity for keeping down the head. As a result of taking guidance from such stalwarts, May gained promotion to the school senior team and finished first in the batting list at the tender age of 14. In his next three years in the school eleven, the last as captain, May continued to compile big scores with style and regularity. 4. Royal Navy: After schooling, May had to do two years’ national service as Writer May of the Royal Navy. Interestingly, on one occasion, the scorecard abbreviation WTR puzzled an MCC member who thought he must be the mess waiter. 5. Career: May had an illustrious career, both with England and Surrey. In 66 Tests he scored 4,537 runs at 46.77; In First-Class cricket, he scored 27,592 runs at 51. 6. Part of invincible teams: May was a crucial member of two of the most successful teams English cricket has ever seen. He played for the Surrey side that who won the Championship every year between 1952 and 1958. At the same time, he was an integral part of the England team that never lost a series in the same period. 7. Captaincy: May was the deputy to legendary English cricketer Len Hutton and inherited captaincy of England side after Hutton fell ill in the year 1955-56. He captained England in 41 Tests, a record for a long time. England won 20 of those Tests and lost only 10. Only Michael Atherton (54), Michael Vaughan (51), Andrew Strauss (50), Nasser Hussain (45) and current captain Alastair Cook (42) have led England in more matches than May. 9. Bizarre run out: In 1957, during a match between Surrey and Glamorgan, May was given run out in a bizarre fashion. He played a shot in the air and ran for a single. Thinking he would be caught, May kept running towards the pavilion. The catch was eventually dropped but the fielder threw the ball towards the wicketkeeper. Since he did not return towards the pitch, he was given out as the bails had already been dislodged. 10. Most consecutive Test appearances: In 1959, May set a new record for most consecutive Test appearances when he equalled Frank Woolley’s record of 52, and then missed the next game. The record has been shattered many times over since, and Allan Border now leads the way with 153. 11. Conflict with Jim Laker: May had an intense animosity with another great English cricketer of his time — Jim Laker. May, Laker’s captain at England and Surrey, accused him once of not really trying during a 1958 county fixture. As a result, the angry off-spinner withdrew his availability for the forthcoming Ashes tour. Their ego clash went on for eternity as neither of the legends showed any inclination of backing down. It was only after the selectors intervened that the deadlock was over and a compromise was found so that Laker could go to Australia. In 1960, Laker’s autobiography titled Over to Me was published. In the book, he severely criticised May’s captaincy, the management of the English team during the 1958-59 tour, as also the attitude of both May and the Surrey club authorities towards their county side. The book resulted in a lot of sensation and eventually Laker’s loss of honorary memberships of MCC and the Surrey CC. Though the memberships were later restored, he never played for England and Surrey again. 12. ICC player rankings: In ICC’s retrospective Test Championship Player Ratings, May finds a respectable fifth spot on the batsmen’s rankings. The criteria for making it to the all-time list were sustaining excellent form over a prolonged period and also the highest points totals the respective players ever attained, with no player being allowed to appear on the list more than once. With 941 career rating points, May is fifth on the list. Don Bradman (961), Len Hutton (945), Jack Hobbs (942) and Ricky Ponting (942) are ahead of him. 13. Premature retirement: May took a premature retirement from the game at the age of 32 to work as an insurance broker and an underwriter at Lloyd’s. 14. Hundreds: May scored 85 First-Class centuries during his career and had a realistic chance of completing a century of centuries. But his early retirement prevented him from becoming the first amateur since WG Grace to score a hundred hundreds. 15. Personal life: During the Australia tour of 1958-59, May was greatly upset by newspaper criticism of the presence on tour of his fiancée, Virginia Gilligan, with one report claiming they had been secretly married. They actually married the same year in April, and from then on his enthusiasm for the game seemed to wane. Their marriage was a much talked affair and garnered a lot of media attention. The couple had four daughters. 16. Family affair: As written above, May had no prior cricketing background. But in later life, he did have a cricketing connection. His father-in-law Harold Gilligan played 4 Tests for England, all in the year 1930. Also his younger brother John May played cricket for Berkshire. 17. Back to cricket: In the 1980s, May became a high-profile, and unsuccessful, chairman of selectors for England. Had his stint ended after the Ashes in 1985, it could have been a successful one. But it ended in disarray in 1988 with the summer of four captains and players getting picked and dropped with bewildering rapidity. He also served as President of MCC in 1980-81. 18. Eton Fives: May was also an outstanding Eton Fives player. (Eton Fives is a handball game, similar to Rugby Fives, played as doubles in a three-sided court.) He won the Kinnaird Cup — effectively the national championship — three years running from 1951 to 1953, partnered by his brother, John. As a pair, the May brothers were invincible, and were never defeated. 19. Honours: May was honoured as Commander of the Most Excellent Order of the British Empire (CBE) for his services in the field of cricket. On July 9, 2009, May was posthumously inducted into the ICC Cricket Hall of Fame. 20. Trivia: May is mentioned in the Peter Hammill song, “(No More) The Sub-Mariner”, from the 1974 album, In Camera. 21. Death: May died at Liphook, Hampshire, from a brain tumour on December 27, 1994, four days before what would have been his 65th birthday. 22. 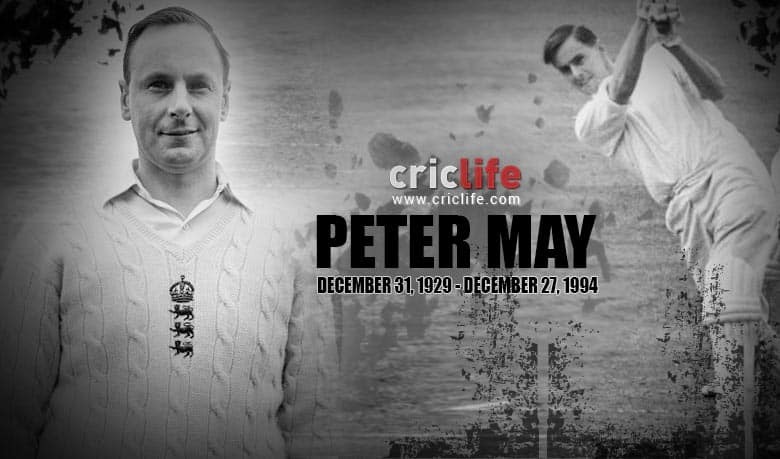 Legacy: May has a stand named after him (the ‘Peter May Enclosure’) at the Oval, Surrey, England.